This page contains affiliate links. When you purchase products through them, you support the site. Thank you! There are so many types of stevia on the market right now. Some brands of stevia extract have a slightly bitter aftertaste. Unfortunately, not all brands of stevia are created equal! The reason I use a powder and not a liquid extract is because the powder is more standardized in sweetness. The liquid extracts all have different conversion factors between brands. Also, the dry powder works better in recipes that don’t have much liquid, like chocolate and cookies. For years, NuNaturals pure stevia powder was my go-to brand because it was a cut above the rest! It was simply the best-tasting stevia extract, with no aftertaste or funky flavors. I featured it in my recipes and cookbook because it was the only brand that my super sensitive taste buds did not find bitter. Unexpectedly, the NuNaturals company altered their formulation in May of 2013. Sadly, the new NuNaturals stevia is definitely bitter, and markedly less sweet than the old stuff. Late last year, I tried KAL “Natural” pure stevia powder , and enjoyed it so much that it was my next stevia of choice for recipes on this blog. However, the manufacturer changed their stevia formulation shortly after I recommended the product to readers! The change in FDA regulations meant that stevia extracts classified as food additives could be sold on grocery store shelves, making them more profitable to produce. Consequently, some stevia manufacturers changed their product to contain 100% rebaudioside A (“rebiana” or “Reb A”). Reb A is just one flavor compound of the stevia plant. 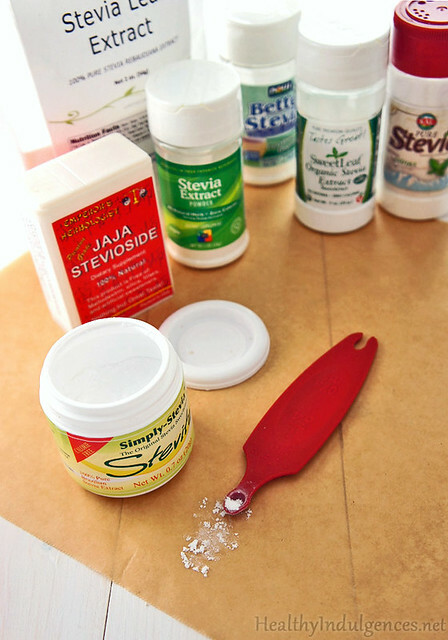 As a result, stevia products containing solely Reb A can taste more bitter than stevia extracts containing a mixture of steviosides. How Do You Bake With Stevia? The powder extract is best for baking, and the liquid extract is ideal for adding to beverages like tea, coffee and smoothies. You will need to use twice the amount of Trader Joe’s stevia in recipes listed on the blog and in the cookbook. My recipes created in 2014 and later list which brand of stevia was tested in them. Remember to let your tongue be your guide when it comes to sweetening your own sugar-free recipes! It’s best to start with too little, then work up to the desired level of sweetness. That tiny spoon with the stevia spilling over the edge is 1/64 of a teaspoon! 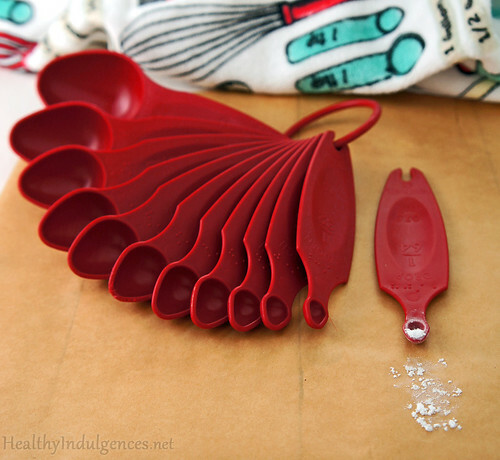 I use this colorful mini spoon set set by Pourfect to measure out my stevia for coffee and recipes. It’s the only complete set I’ve found with such tiny increments! Just don’t let any of your spoons get caught in the disposal. Can you tell, from looking at the photo, that I already learned that lesson? Do you have questions about stevia? Post ’em below! Lauren, I’ve followed your blog for a long time, and I’m glad to see you address this stevia problem! My husband and I used NuNaturals for years, only to find out about the change this year, which has sent us into a disappointing search for a replacement. We use stevia a LOT– in our coffee and cold drinks every day. KAL seems like it might be cost prohibitive in comparison…. NuNaturals sold their pure stevia in those large containers that lasted forever! I don’t see a date on your post, so I was wondering if you have any further updates or any thoughts to add? Hi, Molly! I’m so glad to hear you’ve been enjoying the recipes on this blog. You are right about the price difference. The cost of KAL is $6/oz compared to the NuNaturals bulk stevia (the 1 lb container), priced at $4/oz. Per your inquiry, I contacted the company re: buying KAL in bulk. I’ll let you know their response! Love your blog! So disappointed with NuNaturals! Have been looking around at KAL and it would seem from the reviews on Amazon that they’ve also gone bitter. Look forward to hearing if you find another suitable alternative. Hopefully the formulas will become standardised as it gains popularity. Can only think the huge stevia deal Coca Cola did has something to do with the lack of consistency in the stevia brands now. Thank you so much for the reply. I live in the UK and it’s a barren wasteland for good stevia. I’ve contacted the JAJA people and await a reply. Keep up the inspirational baking! If any readers know of a good stevia brand available in New Zealand I’d be very keen to hear about it! Ordering from overseas would be the last option for me as I’m on a bit of a budget. I am soo disgusted! I bought 3 large bottles of the stuff you picture, the NuNaturals brand, because that’s what you pictured! And now after reading the entire page and googling what you say about stevia, I find you say it is bitter?!!!!!!! I haven’t gone through all the comments…but is there someplace to find a conversion chart to use when baking, etc. I.e. 1 cup sugar = ____ stevia product. I just read about nunaturals, info.one thing I have learned from dr. atkins,to use many forms of sweetners, so you use less -such as lohan,stevia,xylitol, and erythritol. Lauren your post confuses me. You state that readers recommended NOW Stevia and JAJA Stevioside as the top two brands and then provided links to where they can be purchased. However, there is no link for the JAJA brand, instead, there is a link for the Trader Joe’s brand. I’m thoroughly confused. Do you now recommend the Trader Joe’s brand above JAJA? Can the Trader Joe’s brand be purchased in bulk like the JAJA? Is the Trader Joe’s brand the same stevia brand you note on another page that must be mixed at a ratio of 2 teaspoons with 1 cup of erythritol? Do you still recommend the JAJA brand? Thanks. The post office in our town is notorious for losing mail. We have several friends who Bar/Bat Mitzvah or wedding invitations were not delivered to several invitees. They were quite embarrassed making follow up calls to people who thought they were not being included. When it was my turn to mail invites I drove to a post office 2 towns over. I’m happy to report we had no delivery problems ðŸ“«. Home Yellow sweaters are going to be almost blinding for Nashville. With only 18 regular season fights though, the new color makes sense. Not only do they have the guitar pick thing going on, the have 6 white ‘strings going through the numbers on the back, and piano keys on the ‘inside’ of the neckline. I’m assuming that is for the player wearing it to appreciate when they are getting sweatered during a fight. They away whites look much better as they got away from the weird white silver blue sleeve and incorporated the colors as stripes on the lower forearm instead. Required a chance to go through most of the commentary, however i seriously enjoyed your content. The idea become Worthwhile in my opinion and I am bound to most of the commenters the following! It is usually pleasant when you can not simply be informed, and also amused! I think this is interesting offering this report.